I wore this to church on Sunday. I love the femininity and softness of this look. I bought most of these pieces a few years ago, but I've found a couple great alternatives (see links below). Sweater: Ann Taylor. I bought this 2 years ago, but here's another great option. And, another. Skirt: Ann Taylor, also bought about 2 years ago. I love this skirt. It's so delicate and feminine. I found two other great options. Here's the best alternative. Or, you could go with this Tulle skirt. Shoes: Enzo Angiolini Meilee Pump. I love this designer for shoes- always classy and beautiful. Pearls (necklace): Ann Taylor- bought a few years ago. Also, shown here. Pearls (bracelet): A friend got these for me. 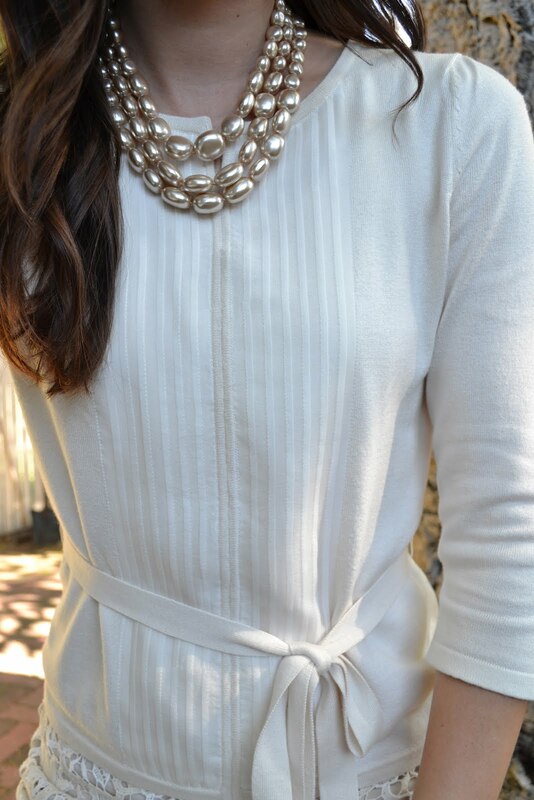 Not a big fan of white, but I like the pearls.